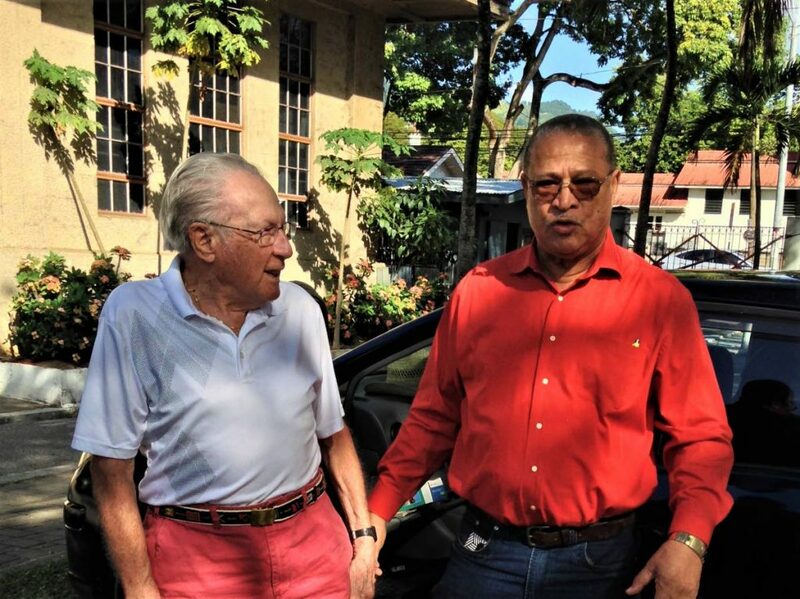 German-born Peter Laband, seated, with Dr Stuart Millar at Millar’s home, Maraval, on December 27, 2018. Laband and Millar’s late father Ian were classmates at QRC when Laband lived in Trinidad as a WWII refugee. Peter Laband cruised back to Trinidad on December 27, 2018 – about 80 years after he had first sought refuge here on the eve of WWII. Laband, 92, was born in Hamburg and fled in 1938 with his family after his Jewish father was released from Buchenwald concentration camp. Laband lived here until 1946. Tour guide Ricardo Rambally met Laband and his wife Barbara, 81, when they disembarked from the Caribbean Princess at the Cruise Ship Complex, and whisked them away on a special day tour of Port of Spain, which Rambally planned after archival research. 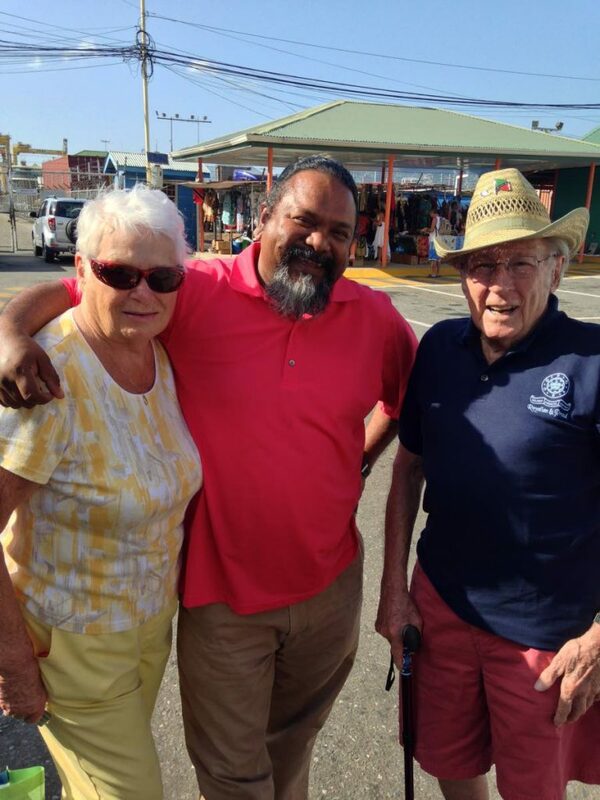 Peter Laband, right, with his wife Barbara and tour guide Ricardo Rambally at the Port of Spain Cruise Ship Complex before re-embarking on the Caribbean Princess. Borrowing money from an uncle in the Netherlands to pay the landing deposit for Paul and his non-Jewish wife – $50 each in Trinidad currency – they left everything behind. “When we landed, my father said to me, ‘Let me teach you some English: It’s not eins, zwei, drei… it’s one, two, three,’” Laband said. Paul, like the other Jewish refugees, on arrival was put in an internment camp. Peter was sent to a boarding house – run by the Anduz family but he doesn’t remember where – and allowed to go to school. 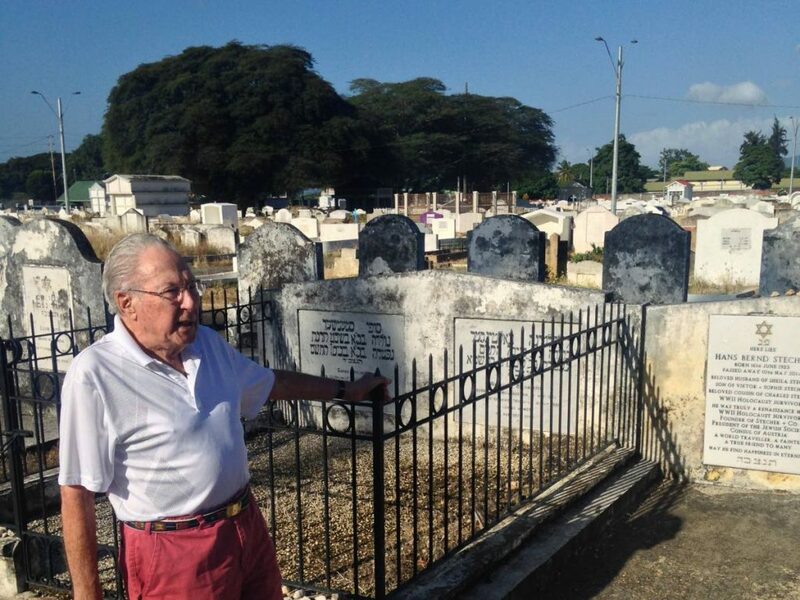 Most Jewish refugees left Trinidad after the war, but a few stayed. Dr Paul Laband lived out his years here, dying in 1958. His white marble headstone is not in the Jewish section of the Mucurapo cemetery. Paul Laband had registered himself and his son as Anglicans with Trinidad authorities, possibly to hide further from Nazis, Laband said. The Labands were among the last Jewish refugees to arrive. Trinidad closed off the scheme on January 1, 1939, Rambally told Laband. 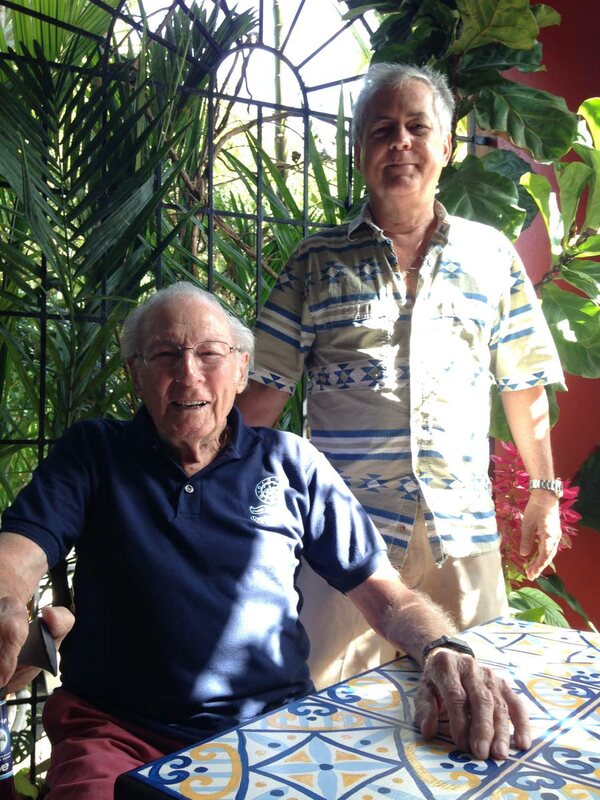 Of the other refugees, the last living in Trinidad, Austrian-born businessman and Jewish community leader Hans Stecher, died in 2014. Laband visited his grave, on a cemetery street with headstones carved with Hebrew. Rambally drove to Roberts Street, Woodbrook, to a bungalow where Laband had once lived, then to their common alma mater, Queen’s Royal College (QRC). As Rambally drove through St Clair, streets Laband had ridden as a teen on his red Raleigh bicycle, the former refugee recalled his boy days. “There’s the college,” he murmured as the building came into view. He sprang from Rambally’s car once inside the gates. A welcoming party met him, led by QRC Old Boys’ Association president Patrick Rabathally. Laband was overwhelmed, he said. Laband enrolled there at 12, months after arrival, and is the oldest living QRC old boy, by their calculations. He’s certainly one of the proudest; right in the school’s courtyard he shucked his T-shirt in favour of a Royalian blue polo presented to him. “Cadets used to drill there,” Laband said as he saw the courtyard. “They still do,” replied Vernette Superville, association vice president. By the St Clair Avenue fence, the old pavilion still stands. There’s a pre-fab building now where there used to be two cricket pitches. Laband remembered getting a cork ball in the head through a hole in one of the nets. He remembered when the school’s North Block was new. Flanking the iconic red-brick and blue limestone main building, it was finished in 1940. QRC Old Boys’ Association president Patrick Rabathally welcomed Peter Laband back to his alma mater. Laband attended the school as a German-Jewish refugee during WWII. He remembered his teachers by name and predilection, and the line given to QRC boys to write out as punishment: “The way of the transgressor is extremely difficult.” He remembered, too, pranks played on him as a newcomer with no English. Mrs Randolph Rust, whose husband had first found oil in Trinidad, gave Laband a scholarship for school fees at QRC. He had to dress up and go to tea with her once a week. After QRC he took a job in the public works electric shop for the US Navy in Chaguaramas. Then he went to BWIA as a traffic clerk, but sometimes flew as a steward when the airline didn’t have enough staff – at the time it only hired white flight attendants, so his skin colour allowed him the opportunity. In planning Laband’s tour with a US travel agent, Rambally had looked up Stuart Millar, who invited Laband to visit, and that was the next stop. Millar showed the spry nonagenarian the “Jamaica train” sugar coppers in his lush garden and plied him with seasonal sorrel. Trinidad took in the Laband family when “the civilised countries were totally closed to Jews,” Laband told Millar. Laband did his Cambridge certificate here, and had to write his exams in triplicate using carbon sheets. German subs were bombing British ships and the three copies each went on a different vessel to make sure one got to England to be marked. Millar talked about his own family and other family names Laband remembered, like Stecher, Lau, Hale, Procope, and Jewish families Laband didn’t remember, like Yufe and Feigenbaum. The tour carried on. Passing the Country Club, Laband recalled it was closed to him as a youth of Jewish descent. He remembered liming somewhere close to Dibe and being warned off by American soldiers. Laband once lived on Belmont Circular Road, and Rambally took him along the streets he knew so long ago. The area is much more prosperous-looking now than it was then, Laband said, and cleaner, too. From there, Rambally drove Laband to Dundonald Street and St Vincent Street, to search for where his father’s offices once stood. Paul Laband established a dental practice after he was released from the internment camp in St James, where the police barracks are now. After a few months in Trinidad, Paul’s wife, Peter’s mother, returned to Germany with Peter’s sister; the two died there during the war. Paul met a widow, Regina Seinfeld, in the camp and later married her. They had a daughter, Katherine, who went to Bishop Anstey High School; both moved to the US after Paul’s death. Laband and Barbara live in Cape Cod in the summer and Florida in the winter. He is long retired. Though he walks with a cane or a wheeled walker, he plays golf and bocce a few times a week, Barbara said. He was never religious, but ended up president of a community Jewish association when he was married to his first wife, an observant Jew. Barbara was the accountant who did the association’s books. Before his wife died, she gave Laband Barbara’s number, in case he had trouble with the accounts after she was gone. He had trouble. They married within a couple of years. Barbara sat mostly silent in the back seat during the tour, her jaw dropping as her husband effortlessly recalled the years he’d spent here. He doesn’t talk about Trinidad at all, she said, as the couple returned to the ship for the next leg of their cruise, to Curacao. She hadn’t seen him smile that much in a long time, she said. Reply to "An exile’s homecoming"